These days, many of us need our devices to be as versatile as we are! That includes wanting a coffee machine that can fill a carafe or make a single beverage. Some coffee makers can even do both at the same time! To show you what these fantastic machines can do you make your life more efficient, we’re going to take a look into 8 of the top options out there. Whether you prefer regular drip-style coffee makers or something more high-tech like the Keurig or Ninja Bar. Carry on, enjoy and have fun choosing the perfect coffee maker for you! The Cuisinart SS-15 is one of the top options for those who want the ability to make multiple cups or a single serving of coffee in the same machine. When you’re on the go, you can easily slide a travel mug into the device and get your coffee without having to use the carafe as a middle-man. However, when you have the time or a group over, you can easily make up to 12 cups of cafe and the carafe will store it easily. On top of that, this machine is also able to use K-Cups and other coffee pods as well. You’ll also be able to aim for a stronger cup using the “bold” option. It also uses a filter that is gold toned, which allows for a better flavor overall. This option might be considered one of the more expensive out there, at a little under $150, but it includes a lot of capability to back up that price. Between the 60-ounce water reservoir and wide variety of coffee pod options, it’s hard to go wrong with this machine! Another fantastic option is the Hamilton Beach Flexbrew. 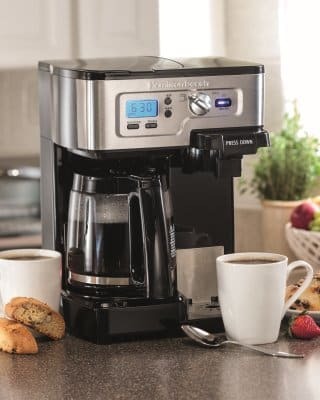 Those who are familiar with coffee makers know that this brand is well-known for a wide variety of great coffee makers, and the Flexbrew is no exception! It’s able to brew into a travel mug or up to 12 cups using the carafe. That way, you’ll be set whether you need a lot or a little. In addition, you’ll be able to choose between a regular brew and a bold one, depending on your taste. This machine can also use K-Cups as well as a variety of other coffee pods, so you’ll have plenty of options. Furthermore, it offers an automatic shutoff after two hours, so you won’t need to worry about leaving it on by accident while you’re at work. It also offers parts that are able to be washed easily in a dishwasher, cutting down on the cleaning hassle. If you’re familiar with other Ninja Coffee Makers, then you might find that the Ninja Coffee Bar has a similar, but more compact, appearance. Thanks to the specialized dial, you’ll be able to use this machine to make a carafe all the way down to a single serving, depending on your needs at a given time. Furthermore, it uses an auto-IQ feature in order to ensure it adds just the right amount of water to your beverage. The water reservoir is also designed to be removable so that you can easily refill it as needed. From simple coffee to a classy espresso, the Ninja Bar can do it all with ease. You’ll even be able to make a delicious specialty brew and coffee drinks that are over ice! Overall, the Ninja Coffee Bar makes it easy to brew just about any drink, allowing you to save money over frequent coffee shop trips. For those who truly want to feel like a barista in their home, the CF111 Ninja Bar is a perfect option. You’ll be able to make a wide variety of single serve or multi serving beverages to suit whatever the occasion calls for. It even includes a built-in frother for when you want to get fancy! As a result, it can make regular coffee, elegant espressos and just about anything in between. It’s also a pod-free option which gives you more control over the grounds-to-water ratio you want. For those hot summer days, it’s even able to make an over-ice drink that will give you a boost and keep you cool. Do keep in mind that this machine may not be as compact as other options out there. Consequently, you’ll want to make sure you have the space! Otherwise, it’s an excellent option for those in search of the most in versatility. If you like a more compact option, the Hamilton Beach 49966 is a perfect tool. Like the other options in this list, it’s able to brew into a carafe or directly into a mug for a single serving. You’ll also have the option to use your favorite type of coffee or a coffee pod such as K-Cup. When you need to make a lot, the carafe is also able to hold 10 cups so you’ll have plenty to share! This machine also contains two brewers depending on whether you want a single serve or to use the carafe, and each contains their own water reservoir. It’s truly a machine that is providing you with two coffee makers in one! Furthermore, it also offers the ability to brew standard or stronger brews for when you need that extra kick. It’s absolutely a machine that is worth taking a look into! Many of us are familiar with the name Keurig, and it’s no surprise that there’s a Keurig model that can cover your single-serve and multi-serving needs. The K250 is able to brew several single-serving sizes ranging from 10 ounces to 4 ounces. In addition, it’s able to brew a cafe ranging from 22 ounces to 30 ounces. Like many other machines, this one also allows you to have some control over the resulting brew strength. On top of that, it allows for the high-tech convenience of a touchscreen. With a 40-ounce water reservoir, you also won’t need to worry too much about refilling it often. It’s truly worth a look if you’re a fan of Keurig. If you want something even more high-tech than the K250, the Keurig K575 is a perfect choice. This machine offers an even larger water reservoir, at 80 ounces. The touchscreen on this device is also in color, and you’ll be able to change the touchscreen wallpaper. You’ll also be able to control the strength and select from a variety of single-serve and carafe options. Just make sure to purchase a carafe if you need one, as it’s not included with the machine. Furthermore, as a Keurig machine it’s going to be designed to use K-Cups, though there are some reusable K-Cup filter options out there. The Hamilton Beach 49980A is one of the most highly rated options in this list. It includes a 12-cup carafe that you can use when you need to brew a lot, and on top of that there’s a space for brewing directly into a travel mug. The side designed for your travel mug is also made to work with loose grounds, discs or even coffee pods of various brands. As a result, you’ll get a lot of choices with this machine. It may not come with a fancy touchscreen, but it does offer the ability to select a stronger brew as well as other programmable settings. You’ll have to provide your own travel mug, coffee and water but aside form that this machine has everything you need! It’s well worth a look if you prefer something simple and reliable. How Do The Bold, Strong and 1-4 Settings Work On A Coffee Maker?